Edamame Filled Potatoes Kachories (Savory Potato Balls Stuffed with Edamame) Air Fried and Deep Fried..Your choice !! This recipe is inspired by a friend of mine Mrs. T Gala, who makes the best form of these filled with coconut, chopped chilies, cashew and raisins. I love her Kachories. She always makes them for me for appetizers, when I go to her house for dinner. I decided to make a different version filled with edamame, then I thought let me air fry them and traditionally deep fry them and see which ones come out better. So I made two batches with 5 potatoes each with same filling : Air-fried first batch of 15 and deep fried the next. They both came out good but both need to be served hot as they are crispier when first come out of air fryer and deep fryer. 1 cup grated coconut ( I used frozen grated coconut) You can omit this, if not fond of coconut. While you are boiling potatoes you can prepare the filling. Cook edamame per instructions in Microwave. In a food processor finely grind cooked edamame. Add ginger, cilantro and cashews, peanuts, lime juice, cumin powder, salt, sugar and black salt. Grind all these together until pesto like consistency. If you desire you may leave the cashew to be added in chopped form. Transfer this in a bowl and add chopped onions and jalapenos. Taste and adjust salt, sugar, lime juice and Amchoor (mango powder) based on your desired taste of sweetness tartness and desired saltiness. Make small balls from this paste and put them in fridge while you prepare the outer shell with potatoes and corn starch. Peel boiled potatoes and mash them with potato masher or ricer. Add corn starch or arrowroot, salt, black pepper. Asefoetida. Mix everything and kneed in to dough like consistency. Divide the dough in to 30 golf size balls. Cover the balls with wet cloth. Take out the previously made filling balls. Press potato balls placing them with finger tips on palm of your other hand in to 3" circle. Place the filling in center of this flattened dough. Cover the filling bringing the edges together and make a smooth surface ball without any filling coming out. Take the corn startch in a plate and roll coating the ball evenly with corn starch. Place these balls on a tray. Line the tray of air fryer with parchment paper. Once all the balls are ready, spray evenly with cooking oil on all the side. Placed the coated and oil sprayed balls on parchment paper and air fry them for 10 min or until light brown. Take the tray out and carefully turn the balls over and air fry for 5 more min, watching so they don't turn dark, but maintain nice light brown color evenly. Both sides should be nice evenly brown. I made another batch or 15 with deep frying method. You make the balls the same way as before and coat them same way. This time heat the oil in electric deep fryer at 400 degrees. Deep fry them until golden brown on all sides. Take them out on paper towel to drain all the oil Serve hot with desired sauces. So here they are, prepared both ways. You decide if you are watching calories the air fried taste the same as deep fried. 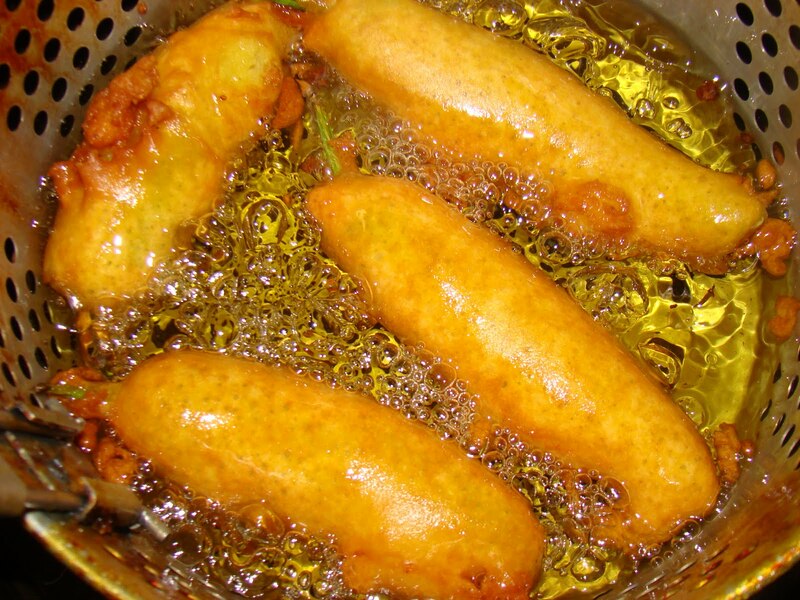 Deep fried ones are for you if you want to indulge yourself. If you only want to make 15, you may only use 5 potatoes and cut the filling ingredients in to half the quantity each. You may add chopped cashew instead of grinding them, and you may use golden raisin, but I am not fond of raisin chunks in my fried savory snack. You can adjust the heat by adding more or less Jalapenos or chilies.